When it comes to cleaning your teeth, few dental instruments can match the power and speed of an ultrasonic scaler. Ultrasonic equipment was first used in dentistry back in the 1950s; today, ultrasonic scaling is a mature and time-tested technology. In experienced hands, these high-tech instruments can disrupt and flush away bacteria along with hard deposits that your toothbrush can't touch — and they can even help moderately stained teeth look brighter. Chances are you may already be familiar with ultrasonic scalers — or at least, your teeth are. They are the tools of choice for many dentists and dental hygienists. Why? Because they're so good at removing the buildup of stains, dental plaque and calculus (also called tartar) from the crown (above the gum) and root (below the gum) surfaces of the teeth. Since the removal of plaque and calculus helps eliminate harmful bacteria beneath the gum line, cleaning with an ultrasonic scaler (sometimes called “root debridement”) is a primary means for preventing gum disease. With its vigorous, repetitive motion, the tip is easily able to break up hardened deposits on the tooth without damaging it. Some tips are so fine that they can be used not only on the crown surfaces of teeth, but on the roots as well. 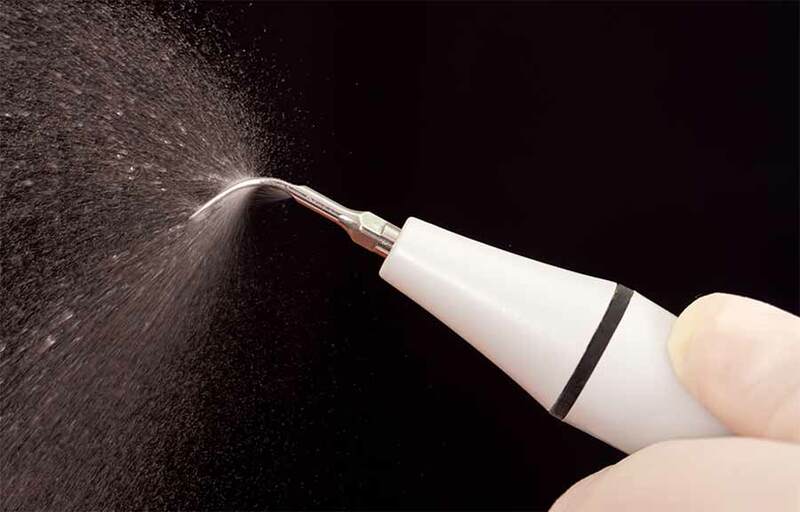 The ultrasonic scaler can rapidly remove tough stains and tartar, meaning less time for the patient in the chair, and less fatigue for the clinician. In fact, the tool's tip moves so quickly that it must be cooled by a constant stream of liquid, a process called lavage.